Meeting new people is one of my favorite things about travel and of course I tend to meet a lot of photographers. I met Ilan on a day cruise from Valdez Alaska to the Meares glacier in the Prince William Sound. For long portions of the cruise we had the whole bow of the boat to ourselves, as only photographers want to be out there in the wind and cold (although it wasn’t very cold, there was a guy wearing only shorts and T-shirt who toughed it out most of the day too). We hit it off and were chatting most of the day about photography and travel, and when the cruise was over I told him where we were headed for sunset/camp for the night in case he wanted to meet up and shoot the sunset with us. We went our separate ways and I thought I had seen the last of Ilan as we headed up Thompson Pass to photograph the sunset. It was a beautiful sunset, and when it was nearly over I saw someone pull up and start quickly hiking towards us. It was Ilan! He missed most of the sunset because he spotted some bears on the way up and photographed them for a bit. I was mostly done shooting the sunset so I just hung out and made a few pictures of Ilan while he made a few pictures the mountains and the rising moon. It was a fun day hanging with Ilan and I really hope our paths cross again on a future adventure. Thanks Ilan! Tips for photographers: These photos were made after the sun went down during blue hour. 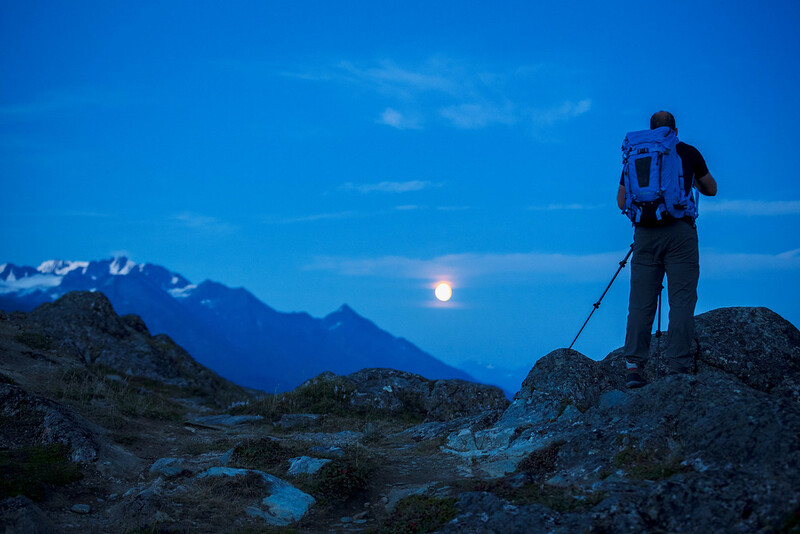 I say blue hour, but during Alaskan summers blue hour lasts for hours, almost all night depending on where you are. In the top photo you can see eye to eye with the majestic Chugach Mountains surrounding Thompson pass. The Chugach are a very picturesque range, which are especially dramatic from Valdez at sea level. The bottom photo features a very bright moon on it’s way up during moonrise. 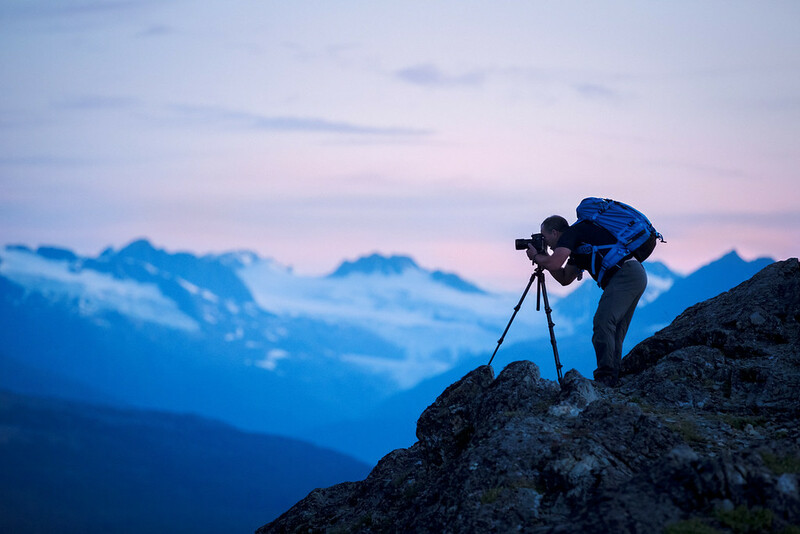 Summers in Alaska are great for photographers because the sunset lasts for hours and there is plenty of light in the sky to make blue hour long exposures all night long. The one drawback is that the sky is so bright with sun and moon light that it’s difficult to see the stars or do any kind of astrophotography, which is kind of a shame because there is a lot of aurora activity that far North. I really enjoy making photos like these that combine two of my passions in photography, the drama of the landscape and the power and prestige of the portrait. I have a deep respect for nature and can’t ever stop exploring the natural wonders of the world (especially mountains). But landscapes are lonely without people in them and to make a portrait in the special places that people go through such great efforts to reach only enhances the power of the portrait. That’s why travel is such an integral part of Paul Bellinger Photography, we want to go to the places that are special to our clients and make pictures that simply cannot be made anywhere else. For destination weddings in Montana or anywhere in the world, please visit Montana wedding photographer www.paulbellinger.com. For the hardest working portrait photographer in Montana please visit Billings Montana portrait photographer www.portraits.paulbellinger.com.